This custom-bodied Rolls Royce with its sculptured lines is an exceptional example of the classic presence and grace that have always been the hallmark of Rolls Royce Motor cars. The elegant interior demonstrates extraordinary craftsmanship with its fine veneers, hand-finished furnishings and upholstery made from only the finest hides. In December 1904, Henry Royce and the Hon. Charles S. Rolls signed a historic agreement founding the Rolls Royce Motor Company. It’s goal: To set new standards of precision engineering and coachwork elegance. The expression, “Quality Remains Long After the Price is Forgotten” was first used by Rolls Royce. 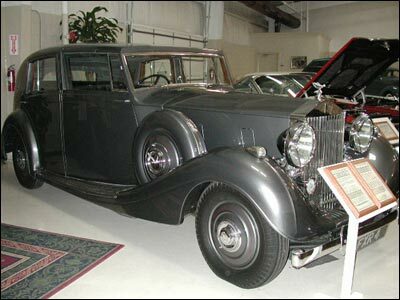 Until this particular Rolls Royce was acquired by Swope’s Cars of Yesteryear, it had remained with descendants of the family that originally purchased it.